“Giants of the Seas” is a new book by Aaron Saunders. 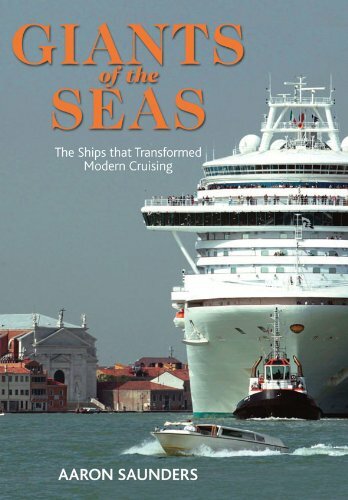 It’s about the development of cruise ships during the modern cruising era. I’ve seen it described as ‘coffee-table’ sized, and is actually 26cm x 20 in size – taller than it is wide. 192 pages long, it is mainly text but is also lavishly illustrated. It’s published by Seaforth Publications, and is physically high-quality – good, glossy paper that sets off the images very nicely. After an 12-page introduction it consists of a series of 40 short chapters, each chapter covering a single ship. The shortest chapters are 3 pages and the longest is 6 pages, but most are 4 or 5 pages. The chapters are arranged in chronological order, starting with 1988 and Sovereign of the Seas, and ending in 2012 with the Viking Longship class – yes, a river cruise ship. That leads me onto pointing out that the range of ships included is considerable. While a number of them were in their time the biggest cruise ship in the world (or at least the biggest new ship – Sovereign of the Seas) and are included because that increased size allowed the inclusion of some new feature or other, many smaller ships are also included – the R-ships, and many of the other small luxury ships that sail for the likes Seadream, Silverseas and Seven Seas. All have their ‘Why she matters’ box (there’s one for each chapter), which outlines why the ship was significant at the time. A typical chapter would be the one for Celebrity Century of 1995, which is four pages long. On the first two pages (a double-spread) there is just one column of text, as about three-quarters of the space is occupied by an excellent picture of the ship. The ‘Why She Matters’ box also takes up some space on this spread. Turning over to the second double-page spread for this ship reveals a further three columns of text with two smaller pictures, plus a small information box giving the ship yard, dimensions, capacity, and gross tonnage. All in all it lays out the main features of the ship, places her in the context of her line and her times, and explains what her significance and legacy are. Inevitably with a book like this, one starts to consider why the ships it covers have been included and of course why others haven’t. In my case I was disappointed to find that there was no mention of Oriana – it seems to me that although not technically exciting, she was of crucial importance to the development of the UK cruise market. In other cases this has been enough to merit inclusion – e.g. HAL’s Statendam is included precisely because she “brought Holland America Line firmly into the modern era of cruising”. Well, that’s pretty much what Oriana did for P&O. On the other hand, I was a little surprised to see Cunard’s Queen Victoria included – a fine ship I’m sure, but surely, just an adapted Vista class? I emailed the author with some points along these lines, and he very kindly sent me an lengthy and interesting reply. On the non-inclusion of Oriana he said this: “Oriana made its way in and out of the book during my first drafts. It’s the one ship that I actually wish had made the final cut, not the least because the book eventually wound up being published by a UK-based company. And I completely agree with you – the UK cruise market was directly influenced by Oriana because, as you say, most would have pictured Canberra or QEII if you’d said to them, “Let’s take a cruise!” “. But in the end Oriana wasn’t included, and here’s why: “I actually pulled Oriana out for an entirely different reason: I have no less than three books on my bookshelf that focus heavily on her and the P&O fleet. I really wanted to make this book different, for better or worse, so I excised the chapter before it had progressed much beyond the outline stage.” . Which is a fair point. It sounds like I’m being critical of this book and I’m not – reading the book made me think about what makes a successful or significant cruise ship, and the questions flow from that. In summary, this is a book that I enjoy very much and which will take a significant place in my library of maritime matters. Its ISBN number (in the UK) is 978-1848321724. Finally, the author (Aaron Saunders) has a blog , “From the Deck Chair” which I have also enjoyed reading. Hey Tom, you have not commented on P&O’s proposed new livery yet! (I mentioned it on my blog last week). I think I did, Malcolm – here. The second ‘snippet’.